Hey we are surprised as you to hear that Waitrose has their very own dedicated garden section, Waitrose Garden. We always thought that Waitrose was the place you went for your shopping or a reasonably priced breakfast, but they actually have a very impressive store that is all about gardening. They have all kinds of gardening items here, but of course for us here at WhatShed, it is the garden buildings that matter and they have a very good selection of them. Sheds, summerhouses and playhouses can all be purchased here. The selection is why so many people are looking for a Waitrose Garden voucher code. Our aim with this guide is to make sure that you do not get messed around by these money saving sites that claim to have Waitrose Garden discount codes. We have seen far too many bogus deals, offers and promotions that will do nothing but waste your time. We want to make sure that you know how to save money when shopping at Waitrose Garden as well as knowing what sites to avoid. We know that if you have come to this page you are looking for a discount code for Waitrose Garden, as we explain further up Waitrose Garden dont often issue discount code. As such we thought you might like to see what are some of the best discounts that are currently on offer from other garden building retailers. The best tips that 90% of people who SAVE money at Waitrose Garden use! Here we are going to be showing you the way that you can find the best Waitrose Garden deals. We are going to show you genuine ways that you can make your money go furthest and also a few ways to help you keep informed about what deals and special offers are going on at Waitrose Garden. Waitrose Garden is not just a garden buildings retailer, they actually sell a little bit of everything so finding a deal that is specifically for sheds and other garden buildings is very hard. They do put garden buildings in their special offers section: Now we will admit that you never know what is going to be in the Waitrose Garden special offers section, but it is still worth having a good look here. Sometimes it is full of nothing but plants and then other times it may have nothing but sheds. To be honest with you, you never know what is going to be on sale until you click the tab. They make it very easy to find as there is a tab along the top of the screen and there is usually a small special offer preview about halfway down the page. 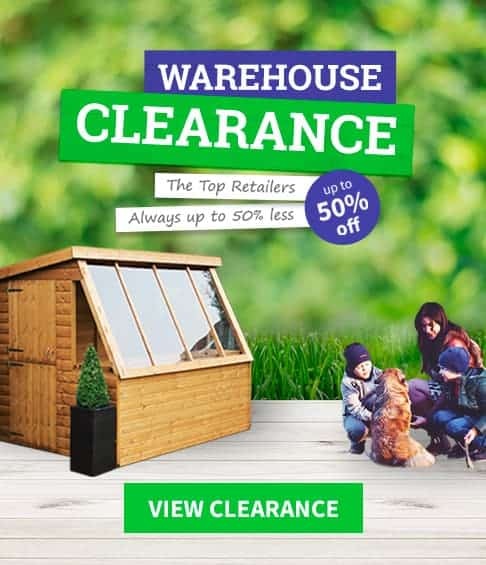 Look for a bargain in their clearance section: You can get a great deal without the need for a Waitrose Garden voucher code if you look in their clearance section. We love a good clearance section as it is always unpredictable what is going to be in there. Most of the time this is stock they want to get rid of so you can get some very good priced deals in here. As Waitrose Garden are a general garden retailer though it is not always just sheds, summerhouses and playhouses that are in here, but we still think it is worth your time to have a look here to see if there is a shed or summerhouse that has been discontinued and is being sold at a crazy price. They have a dedicated Waitrose Garden newsletter: If you want to keep up to date on all the current Waitrose Garden deals, then the best way for you to do this is to sign up for their newsletter. They do not need any major personal information for you to do this so do not worry about having to give them a DNA sample. What is great about this newsletter is that it is not just a general Waitrose newsletter, so when you get this in your inbox, you will not be getting info about the other things Waitrose sell. All the deals and offers will be for garden related items. Most of the other general retailers that carry garden buildings just send a general newsletter covering everything, so this one here is just great. Have a look at their Facebook page: Ok so we will admit that this one here is a bit of a long shot, but if you are always on Facebook anyway then we do not see what harm it will do having Waitrose deals and offers popping up on your news feed. The thing with the Waitrose Facebook page is that it does give you deals and any Waitrose Garden voucher codes that may be floating around. But this is not just a Facebook page for Waitrose Garden, it is a general Waitrose page so you will have to do some serious digging around to see their Waitrose Garden stuff. Still, if there is a sale or special offer going on, then it will pop up and be mentioned on here. A round-up of all the current Waitrose Garden voucher codes we found online. There are not actually a whole lot of ways to save money when shopping at Waitrose Garden as you can see from our section just up above, but that does not stop countless sites putting together what they claim are amazing lists of Waitrose Garden discount codes, promos and deals. The fact is, Waitrose Garden like most other garden building retailers do not actually make a huge amount of profit on their sheds and other garden buildings so they are never going to give out huge discounts like many of these sites claim they do. If you want the best deal you are always best off going direct to the Waitrose Garden site. Waitrose Garden are actually quite a popular garden building retailer and we know how annoying and frustrating it can be when it comes to trying to find a legit deal. So many sites seem to be set up just to waste your time that it will just make you confused and want to smash your keyboard! But we have had a really good look online to see what sites waste your time the most. We used the most common Google search terms to make this list. The search terms we used were: Waitrose Garden Voucher Codes, Waitrose Garden Coupon Code, Waitrose Garden Current Discounts, Waitrose Garden Discount Codes and Waitrose Garden Sale. Most of the Waitrose Garden deals you find online are not for garden buildings! We found Waitrose Garden to be a great garden building retailer, but as they sell so much other gardening stuff, finding a Waitrose Garden deal for a garden building is actually really tough. So most of the time you will find a huge list of supposed Waitrose Garden voucher codes and offers, only to spend time looking through it and realise none of them are for garden buildings anyway! What they claim? We had a really close look at UK Promo Pro and one of the first things that caught our eye and we are sure will catch your eye, is how they make the claim that their Waitrose Garden discount codes and special offers are all valid for the current month. What We Found? There is a huge amount of Waitrose Garden deals listed on here. We had a good look and while a couple of them are for garden buildings they are just links to that particular product and are not actually saving you any money. The worst thing though is that under their current deals they have a whole section dedicated to old and expired Waitrose Garden deals that have been long expired. Clicking on this is an even bigger waste of time than clicking on their current deals! What they claim? One of the things that we liked about Deals Daddy was the way that they did not pad out their Waitrose Garden deals section with a lot of rubbish. They also do not make any bold claims about how all their Waitrose Garden discount codes are current and the best you will find online. What We Found? Deals Daddy is probably the easiest site on this list to navigate. They get straight to the point and have a decent selection of deals to look at. The problems is, first of all none of the Waitrose Garden deals they have listed are for garden buildings. And secondly, most of the deals that we clicked just took us to the Waitrose Garden homepage. So while this is not an overly offensive site, it is still not going to save you a single penny over just going to the Waitrose Garden site directly. What they claim? When you come to My Voucher Codes you see that the deals they have listed according to them are valid for the current month. We are writing this guide in in June and they have June listed as when these codes are valid for. What We Found? This is the kind of site that just completely wastes your time. Now they have Waitrose Garden special offers that do at least take you to the right part of the site, so if you click their shrubs offer, you get taken to the shrubs part of the site, but none of the deals save you any extra money. None of them are for garden buildings either. Also, they have an expired codes section at the bottom of the page which is always something that bothers us. What they claim? Instead of telling you the month that each code is good until, Voucher Cloud go to the effort of giving each individual deal and offer its own expiration date. To be honest, we have no idea if these are true or if they are just random dates they use. What We Found? Now none of the Waitrose Garden discount codes or deals that are listed on Voucher Cloud are for sheds or other garden buildings, but we thought we would click the links they have anyway. Well we were very disappointed to see that no matter what one of their deals we clicked on, we were just taken to the homepage every single time! You will not save any money by coming here first! What they claim? What we find kind of odd about Plus Voucher Code is the way that they do not just claim their codes and deals are good for whatever month you just so happen to be looking at their site, they also make the claim that they are good for the following month as well. Not many money saving sites do this and we are really not sure why they do as we have no idea they can be so sure a deal is going to be still running in eight week’s time! What We Found? This is one of the most pointless sites on this list. As of writing they have five Waitrose Garden deals. The thing is, three of them are just links to the homepage and the other two have expired! If you claim your deals are good for up to eight weeks then why on Earth are you still listing expired codes? Just stay away as you will not be any better off for coming here. 360VoucherCodes.co.uk – All deals are expired! What they claim? 360 Voucher Codes do not just tell you that they keep their Waitrose Garden voucher codes page updated on a monthly basis, they actually tell you the last day they updated the page. On one hand this is something that when you think about it is quite impressive, but it also can show how little attention they pay to what deals are happening at Waitrose Garden. What We Found? All of the Waitrose Garden deals that are listed on 360 Voucher Codes are expired. Actually that is not 100 percent true, as one of the deals is valid, but it is just a link to the homepage. So yes, actually there is not a single deal to be had here. Not even a link to the sales section of the Waitrose Garden site. What they claim? You are not going to have to read countless boastful claims on Fyvor, which at this point of our guide we must say we are very thankful for! They do tell you how long each of their deals has been running for, which is a nice twist when compared to what most of the other sites are doing. What We Found? Fyvor may not save you any extra money than if you were just to go to the Waitrose Garden website directly, but at least the links they do have are valid. For example, they have a “deal” for a cabin which when you click you are taken to that page. But the problem is this is not a deal, it is literally just a link to this cabins page! So while it is good their links are legit, there are still no Waitrose Garden deals here that are going to actually save you any money. What they claim? Does using 4 instead of four make these guys cool? Well we are not all that cool, so we are the wrong people to comment on that, but what we can tell you is that Voucher Codes 4 All do claim that the Waitrose Garden voucher codes, discounts and deals that they have listed are valid for the current month. What We Found? Now to be fair to the people at Voucher Codes 4 All, there is nothing really, really bad on their site. But at the same time when you actually look at all their deals, you can see that they fit into two categories. One is just links to the Waitrose Garden homepage and the other is that these are just the standard deals you are getting direct from Waitrose Garden. So there is no reason to come here and waste your time at all as you will not save any money by doing so. What they claim? Voucher Slug say that their Waitrose Garden discount code section is updated on a daily basis. They to be fair, apart from this they are not really making any outrageous claims about the quality of their deals and offers. What We Found? Well the first thing we found was that Voucher Slug have the cutest mascot of any of these sites. But that cute slug as far as we know does not have a relationship with Waitrose Garden so we do not think he can get you any exclusive deals. The deals that they do have listed are just the standard links to the Waitrose Garden homepage that we have seen time and time again. Add to this they have a whole section dedicated to old and expired codes. Really coming to this site is just a big old waste of time and is not going to save you any money. What they claim? Promo Vouchers claim that they update their Waitrose Garden discount codes daily. They also make the claim that they have the very best deals and they make it a point to tell you that their deals and offers are free. What We Found? Now Promo Vouchers may like to tell you that they are free, but can you really put a price on your time? All of the links here are just going to take you to the homepage. Even though some of the deals they have listed are actually valid deals that are happening at the Waitrose Garden site, they still just link you to the homepage. We found that there was not a single Waitrose Garden voucher code here that was actually going to save you any money. You are far better just heading to the site yourself and not messing around with these guys links!